March 2018 – We love getting off the beaten path in our travels, and as we headed north from Arizona in our seasonal migration this year, we looked for new treasures and new routes through Nevada and into Utah. Our first detour at Katherine Landing in Arizona took us to a beautiful overlook on Lake Mohave. 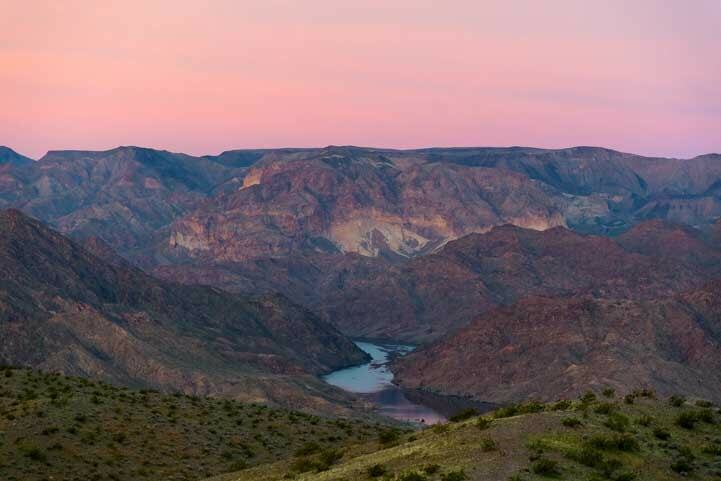 We had driven the North Shore Road alongside Lake Mead outside of Las Vegas last fall (blog post here), and we had been smitten by the beauty and quiet we found along the way. 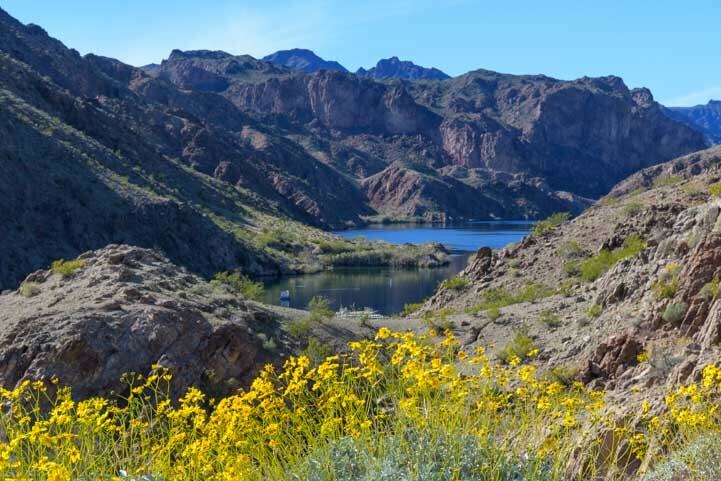 So in our Spring migration we drove back up that route, but this time we drove down as many of the tributaries leading to the Colorado River and its two lakes in the area, Lake Mohave and Lake Mead. 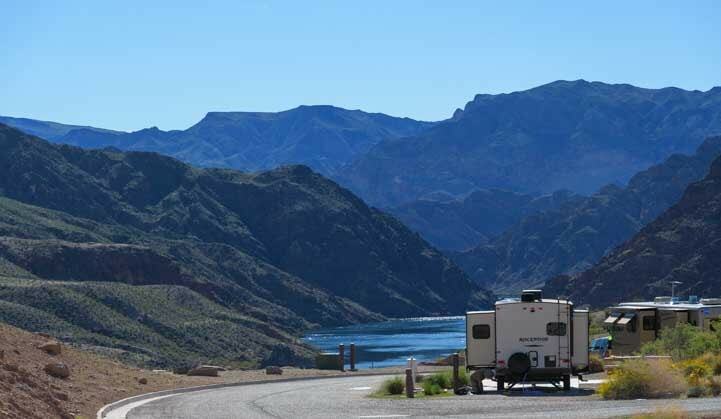 Before reaching Lake Mead, we drove along the east side of the Colorado River in Arizona and discovered beautiful Willow Beach Marina and Campground. 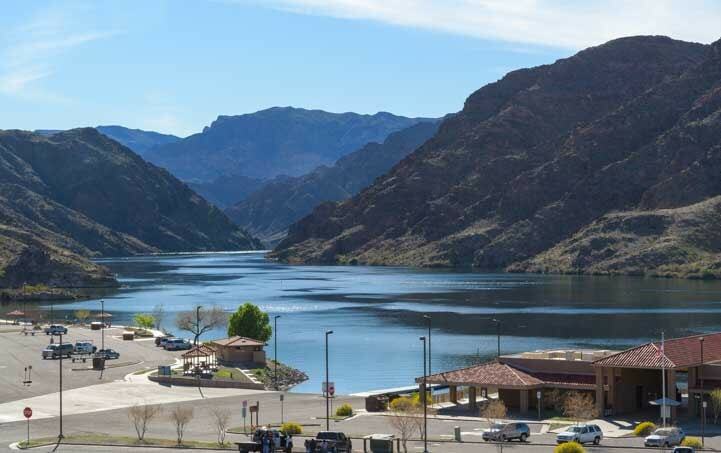 Tucked into a bend in the Colorado River where the rugged mountains loom up on either side, Willow Beach has a marina for boaters and a pretty campground for RVers. We loved the views from the overlooks and found that some of the sites in the campground have spectacular views too. US-93 doesn’t offer too many views of the Colorado River as it runs between Kingman, Arizona, and the outer eastern edges of the Las Vegas suburbs, but one scenic overlook just north of the Willow Beach turn-off was lovely. A glimpse of the Colorado River in Arizona at sunset. We didn’t have a sunny day for our drive along Lake Mead’s North Shore Road in Nevada, but it was striking and dramatic nonetheless. 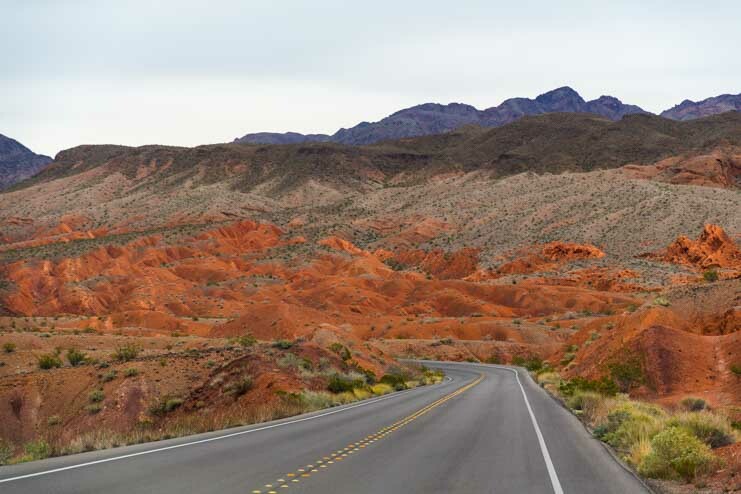 The North Shore Road around Lake Mead east of Las Vegas has some great views. At times the landscape was filled with red rocks. Driving into the red rocks. There are lots of pullouts on the North Shore Road and quite a few hiking trails as well. We stopped at several and hiked up to dramatic vistas overlooking the otherworldly land. Layers of color in the landscape. There are lots of pullouts and some fun hikes along the North Shore Road. 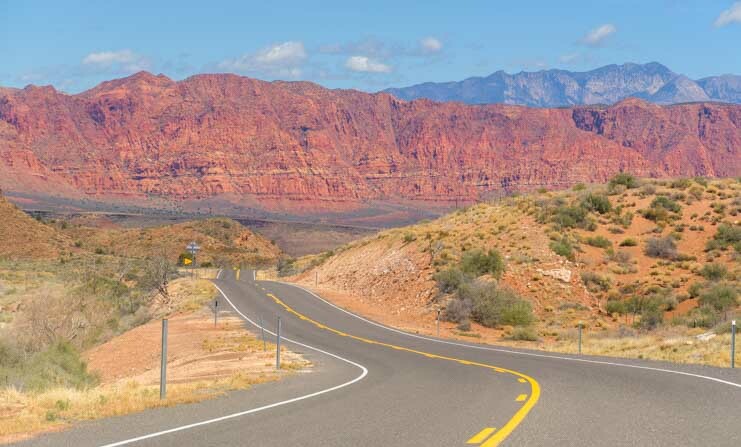 The tiny ribbon of road is almost lost in the sea of red rock ripples. 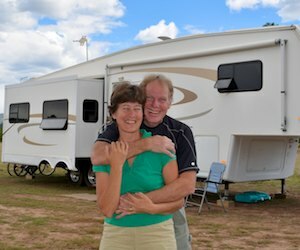 There was very little traffic on the road, but we weren’t the only RVers! 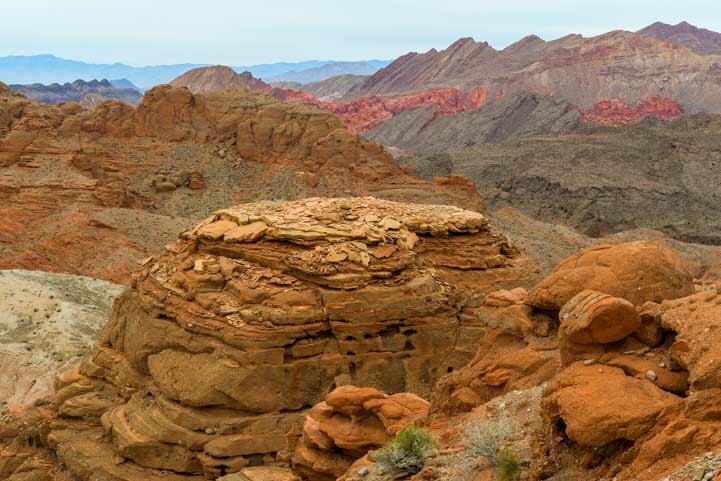 Last fall we stopped at Redstone Trailhead and did the pretty half mile hike around a red rock outcropping, and we couldn’t resist doing it again this spring. 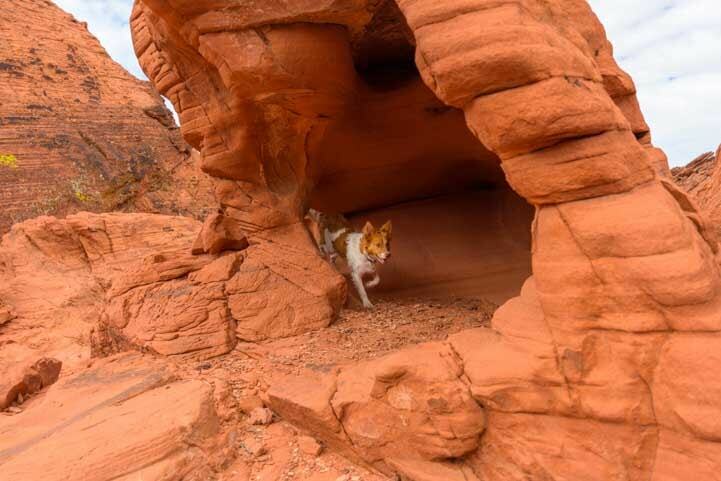 This time we had a spirited companion with us who wanted to check out every nook and cranny in these glorious red rock formations! Buddy explores the Redstone Trail. In addition to dozens of pullouts and hikes along this route, including some that go back to natural springs (very cool! ), there are also quite a few turn-offs that go down to the water’s edge. 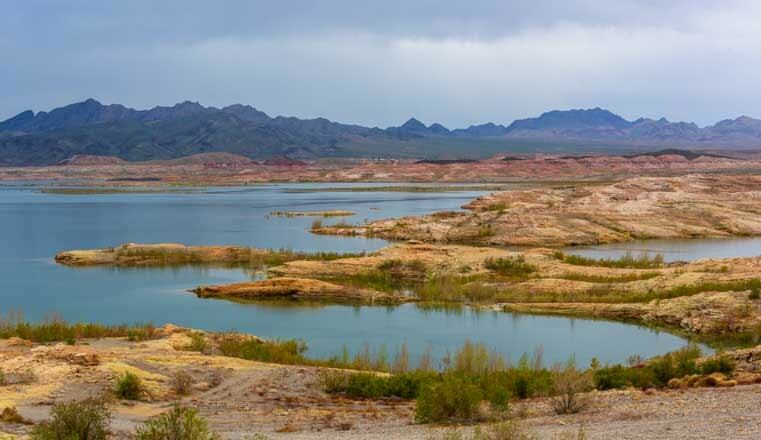 Like all the desert lakes that have been created from wild rivers in the West, the places where the desert meets the water around Lake Mead are stunning, and we loved photographing all we saw. 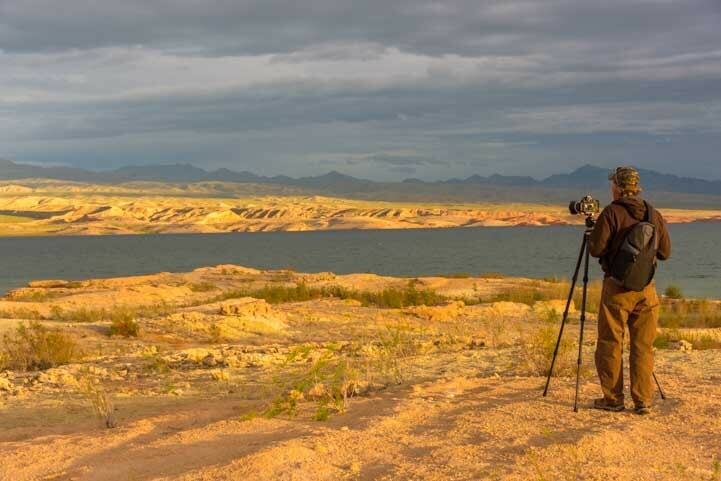 Magical light at the golden hour on Lake Mead as a storm threatens in the distance. 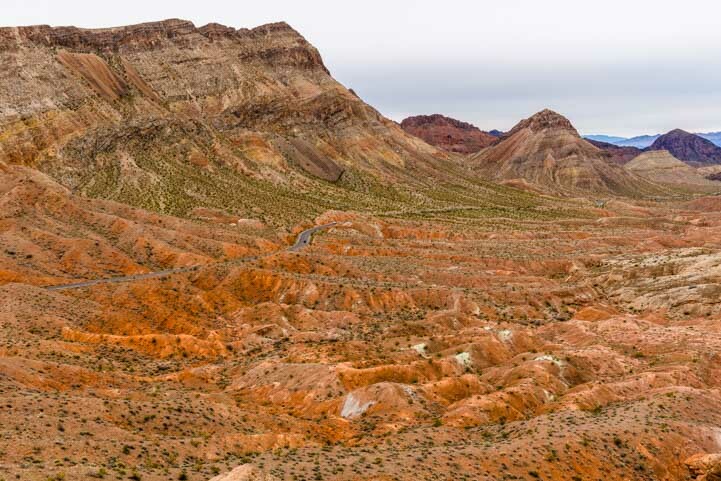 Before the landscape was filled with river water to make Lake Mead, there were deep canyons and washes everywhere. These became islands and peninsualas when the Colorado River water rose, and today there are endless coves and promontories all around the lake. 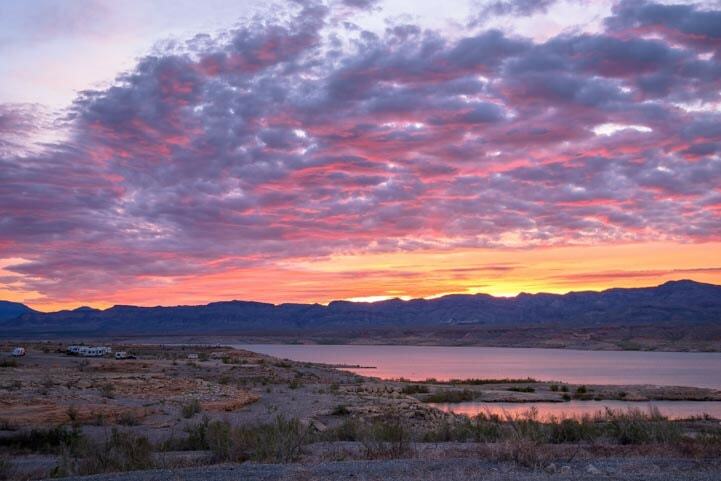 The water in Lake Mead is well over 100 feet below where it was intended to be when the lake was created. 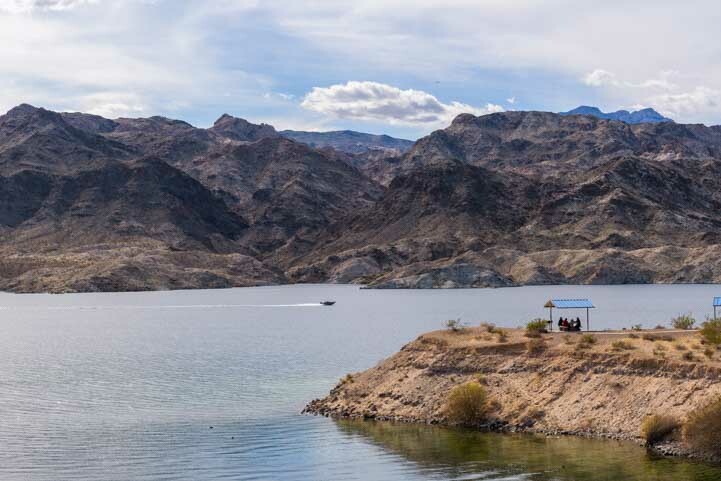 The water height fluctuates a little through the seasons each year depending on rainfall in the desert, snowfall in the mountains and water releases at the various dams upstream. One fascinating effect of all this water management is the plethora of sea shells everywhere. Piles of clamshells and crustaceans can be found half a mile from the water’s edge! By the same token, lots of trees and bushes wind up immersed in water for a season or two. 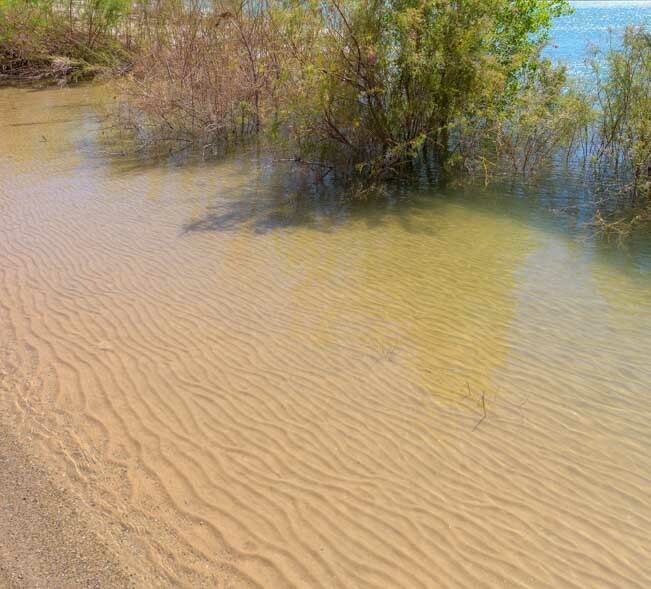 We loved the ripples in the sand under the water. Buddy romped all over the place. We’ve discovered he loves climbing rocks and he’s very good at it too. Naturally, our cameras clicked away. What a shock it was to look at one of our photos later and see the big fish swimming by him in the water! Nevermind the dog. Look at that fish! Sunrises and sunsets were especially beautiful in this exotic land. 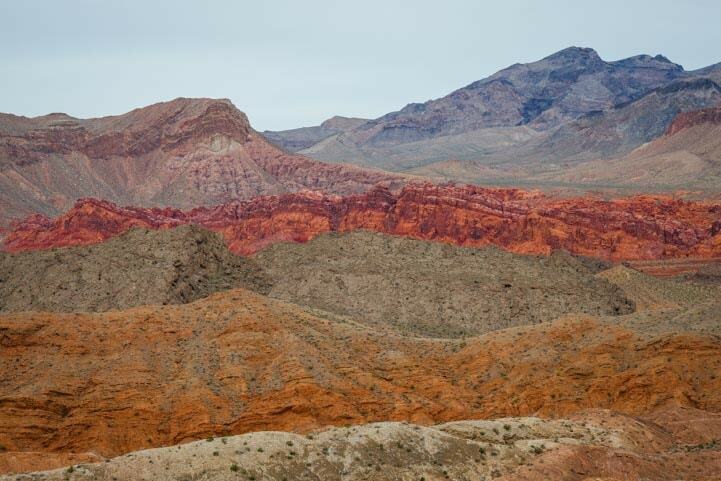 We wanted to go to Valley of Fire State Park, a fabulous little jewel in southern Nevada. We had been twice before (blog posts here and here), and we had loved every minute of those visits, but the last one had been nine years ago. Both times we had gone during the first week of October and there had been plenty of room in the campground for folks without reservations. Not so this time during the Utah schools’ Spring Break. There was no room at the inn. Darn! Studying our atlas of southern Utah, we decided to try a route we had never driven before. This led north from Littlefield up towards Gunlock State Park, well away from the heavily traveled south-to-north routes that go into Utah’s most dramatic red rock scenery. But there were still some glorious views to be seen! Red rocks fill our views on the way to Gunlock State Park, Utah. 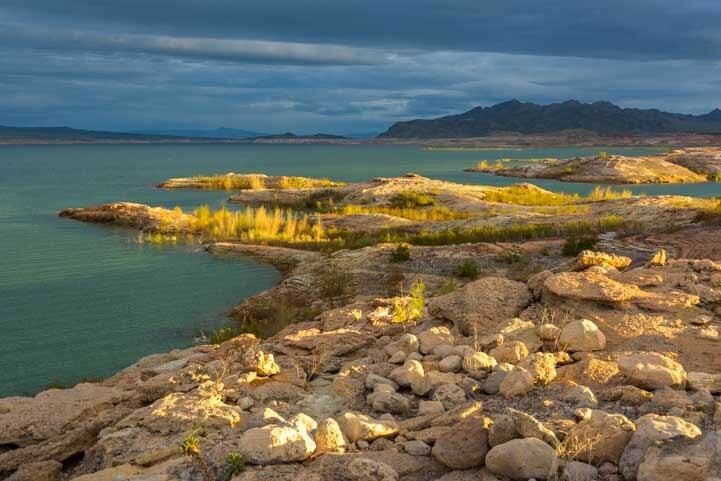 Gunlock State Park has a small campground on the edge of the water with pretty views of the small lake. Gunlock State Park embraces Gunlock Reservoir, a small lake. 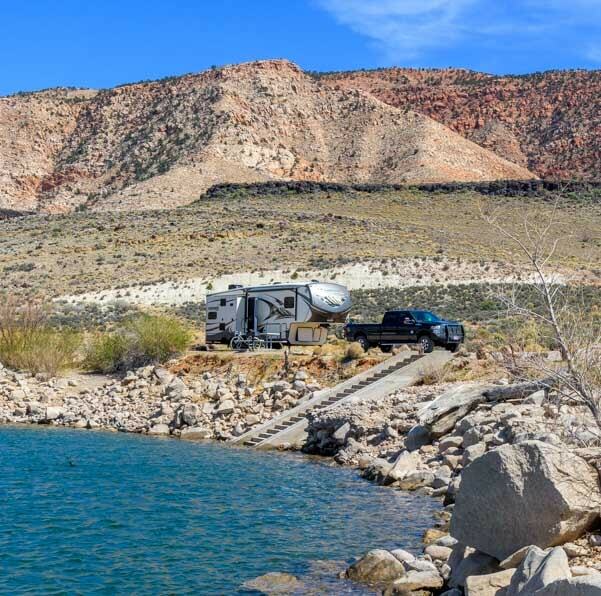 The campground was vacant except for one fifth wheel perched on the edge of the reservoir next to a staircase leading down to the water. All Right!! We hadn’t even known a Pie Destination was on our itinerary! Mark is a big pie lover, and I hold my own too, so we made a beeline over to Veyo Pies to sample their chicken pot pie for lunch and take home a blueberry pie for dessert. Yum! Mark the Pie Man found his Pie Destination (even though he wasn’t looking!). Nearby, we stopped at Baker Dam to play along the edges of the small lake. 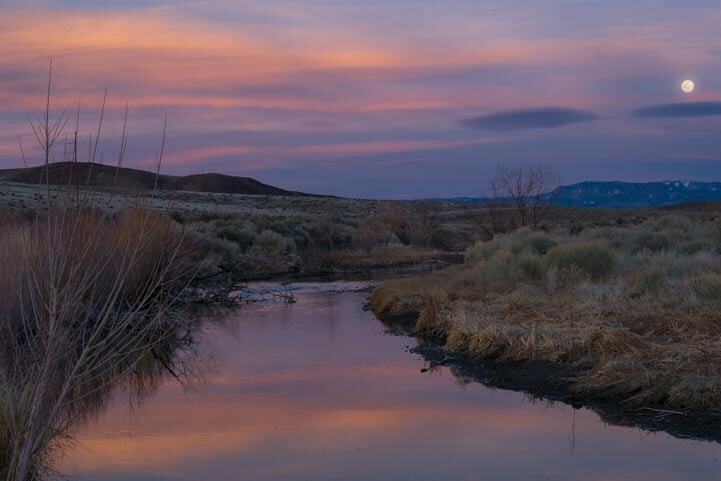 Baker Dam Campground was chock full with families for the local Utah schools’ Spring Break, but the sunset views along the river were very pretty. Sunset during the full moon at Baker River. It is always a gamble in the spring to leave the growing warmth of the southwestern deserts and head north into the mountains. As we continued towards Cedar City we got our first glimpse of snowcapped peaks. 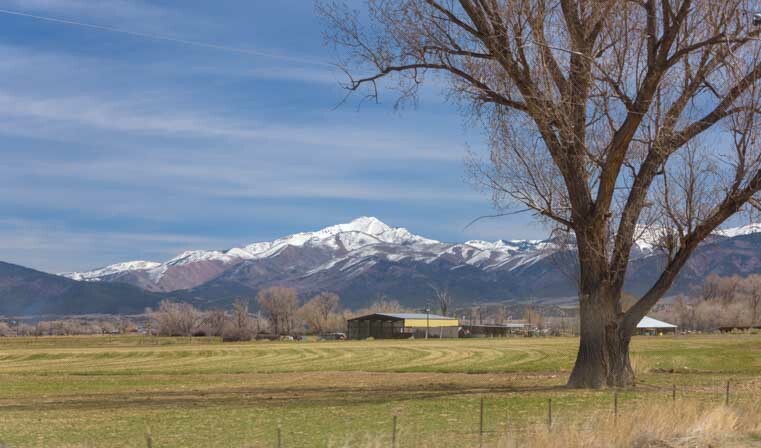 In early spring the mountains were still capped in snow. The nights grew cold and we had to dig out an extra blanket, but the views during the days were worth it! Continuing north on secondary roads, we stopped at a few Recreation Areas along our route. Only a few intrepid RVers and fishermen in winter jackets and hats were out enjoying them. In a month these places would start to get busy, but at this early season they were very quiet. In true Spring fashion, Nature teased us with some beautiful warm sunny days in between chilling reminders that Old Man Winter hadn’t retired just yet. We swung through the tiny hamlet of Minersville, stopping briefly at Minersville Recreation Area, and continued on through to Beaver. 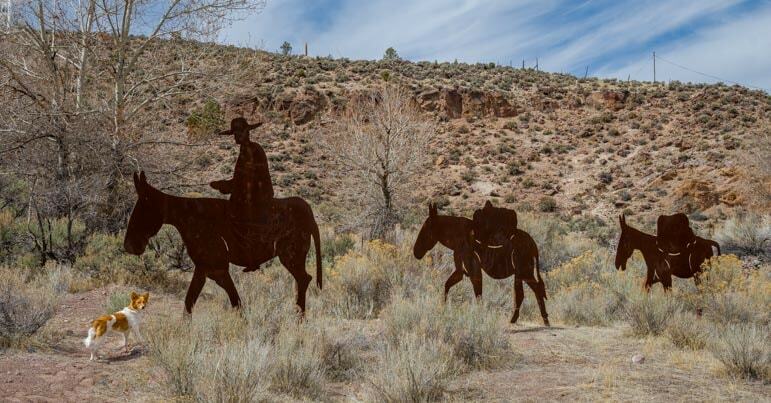 Portions of our route through Utah had followed the Old Spanish Trail which is marked in many places with large metal cutouts of riders on horseback. We saw metal cutouts like these in several places along the Old Spanish Trail. 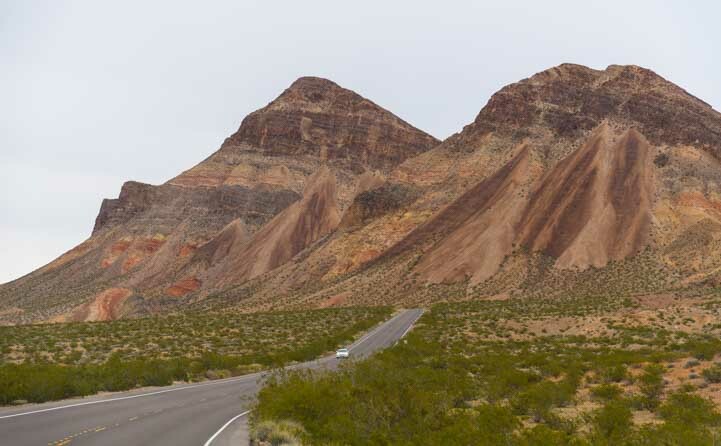 If you are heading out of Arizona to points north, consider trying a route that includes one or several of these smaller roads instead of battling it out with the big rigs on I-15! 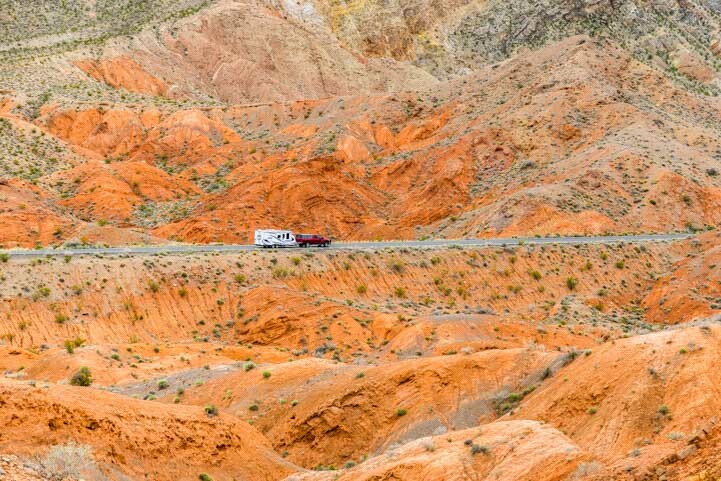 This entry was posted in Nevada and tagged Back Roads RV Trips, Nevada, New, Travel, USA, Utah, Utah Scenic Drives, WP Travel by Roads Less Traveled. Bookmark the permalink. Wow, thanks for the tip, Lisa! I just looked it up and we’ll definitely try to fit it into our travels some day. Sounds like a neat area well off the beaten path…our favorite! Your comments and photos are always so enlightening and enjoyable. One suggestion, and one question. Suggestion: Why not include a map of the roads traveled for those of us who would like to follow these off the beaten path routes? Plus as residents of southern AZ and 5th wheel travelers, do you have a secret for avoiding Las Vegas?!! and the horrible roads always under construction? 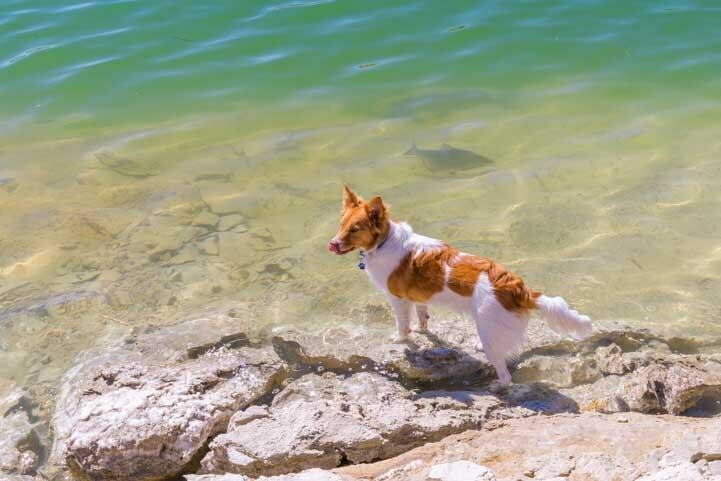 Question: As dog owners who’s dogs also travel with us, what caution do you take when letting Buddy roam in this country given the plethora of rattlesnakes etc? Thank you for the compliments, Chuck. I include a map link with every post and have been doing that for the last few years. It is in the reference section at the bottom of the post, just below the “Subscribe” button. It is a link to Google Maps which is interactive so you can zoom in and out. We go through Las Vegas only when we are headed there (usually for the Interbike bicycle trade show). Otherwise we just take the smaller roads that go around it. We do that for all big cities! As for Buddy and rattle snakes, we are hoping he learns the things he needs to know to stay safe, including both natural and man-made dangers. We heard of a rattle snake training course for dogs in the Phoenix area and might look into it another year. For now he’s outside for most of everyday learning about the world, and we caution him and teach him as best we can. You guys really know when and what to photograph! This was a great article! Thanks! We keep our cameras clicking, that’s for sure, and we love it!! Such drama and color in this post – plus great descriptions ! Thank you! 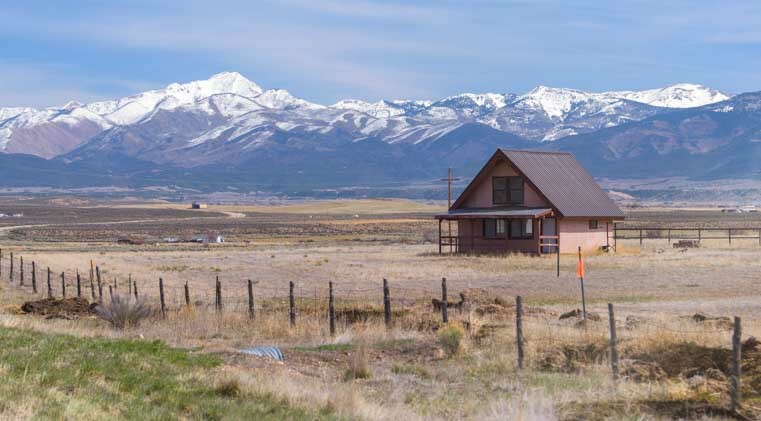 These states are all gorgeous, even in the less famous areas. It is such a pleasure and blessing to have the time to go exploring! You are so very welcome, Jeff. Your enthusiasm put a huge smile on our faces and makes the sharing especially rewarding!! Hi Emily & Mark…..we too discovered the pie shop in Veyo last year on our way back from Colorado last September. We stopped at the BLM (I think) campground north of Veyo for a night so we could cycle thru Snow Canyon and St. George on the tandem. We wanted to take advantage of an unbelievably cool period for St. George (which never happens for us!). Had a great time…. How fun, Tara! It’s a neat little shop, and we were amused to see a huge sign that they take orders for Thanksgiving pies starting a month before Thanksgiving!! I wish we’d picked up their Mountain Berry pie along with the blueberry pie…next time!! 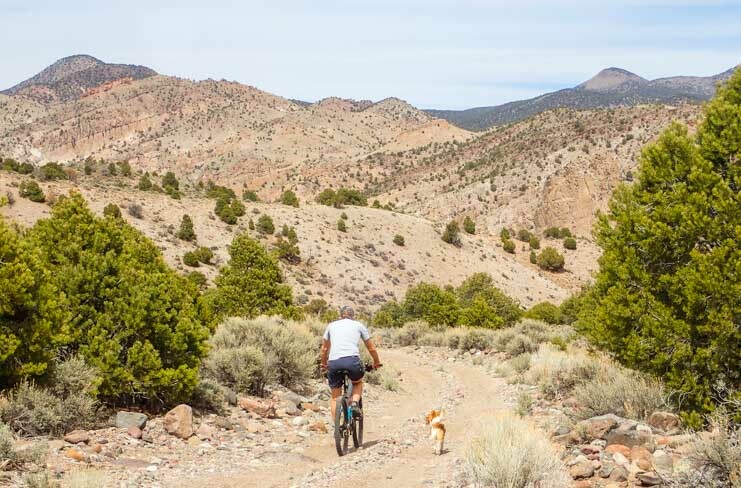 We rode our bikes through Snow Canyon and on the St. George bike paths years ago and loved it. It was October, a bit chilly and very scenic, but I remember getting several flat tires from the goat heads!! Your blog is so well written and informative – I so look forward to each issue! Although my husband and I are stationary for at least the next year, I have been compiling a list of what we want to see and do once we get traveling. And you are a great help! That is wonderful to know, Laurel. Thank you for dropping a line! Have fun with your research — there are endless great places to visit — and have fun once you hit the road! Well, we had snow the other day in the Utah mountains, Deborah, so we sometimes get gray skies and inclement weather too (Buddy loved eating the snow, though, so it was a hoot watching him!). We know what it’s like to live vicariously through other folks’ adventures, and we love being able to pass along a little inspiration from the blessings we are enjoying in our lives now. Thanks for reading!! Hey, looks like you guys landed in the same exact spot at the Willow Beach campground that we did in August 2016! A large herd of big horn sheep would pass right around our coach every afternoon. It was a cool spot! Always enjoy your posts. Thank you, Valerie! How awesome to have big horn sheep wander past your coach every afternoon. Lucky you!! We experienced that in Flaming Gorge UT and the SD Badlands, but not at Willow Beach. How fun! !